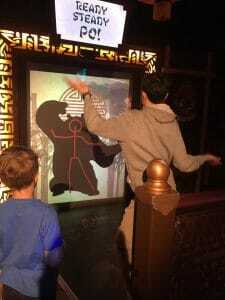 My family are blogger ambassadors for Merlin Annual Pass and we take our responsibilities very seriously. 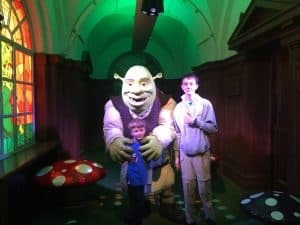 Last year I took my 12 year old son to see Shrek’s Adventure on the South Bank in London, and he didn’t even bat an eyelid at the fact it’s aimed at much younger children. In fact I think he enjoyed it a bit more than he expected to. So when my 8 year old nephew wanted to go this year, we were straight there. I still can’t get over the fact that my baby boy is nearly 13 and quite considerably taller than me. 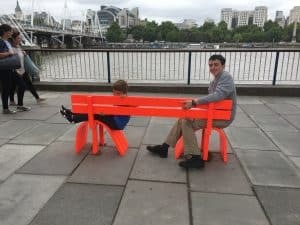 He makes his own way to and from school, he plays bass guitar, and (although I don’t want to say it) he’s not a child any more……. except when he is of course! Shrek’s Adventure is one of those places where people who have been a child quite recently, can pretend to be one again. 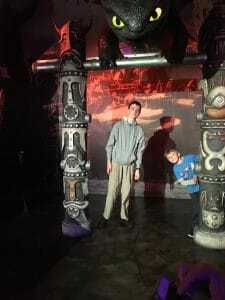 This time we took a real live child with us (my 8 year old nephew Charlie) and so my son could hug the giant, push to the front and join in all the childish fun on the pretext of looking after his cousin. 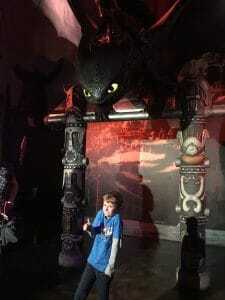 It is a definite advantage when you come to this attraction if you have seen one or more of the Shrek films, and particularly the one which has Rumplestilskin as the villain. As it turned out, Charlie hasn’t seen the Shrek films, although his mum and I have , several times. My sister was surprised she hadn’t shown them to him – big dose of mummy brain there. So Charlie was a bit confused, but I think he enjoyed himself anyway. These photos don’t really do the attraction justice, as you are not allowed to take photos during the main event. Essentially you are led from room to room where a succession of live actors involve you in a story. The story begins with you flying a bus to the land of Far , Far Away, which accidentally crash lands, and then you have to find things in order to get yourselves home. There is a small amount of ‘mild peril’ but only very very mild and most children were getting very excited by the story. The magic bus ride at the beginning is very engaging indeed. 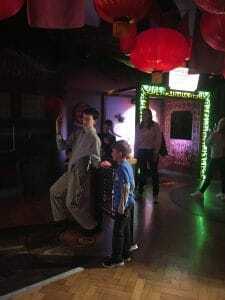 There are plenty of opportunities to join in and one or two parents will get lampooned – good old fashioned comedy fun, whch reminds me of childrens party entertainers when I was young. 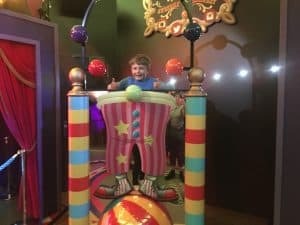 The whole attraction takes about an hour to get through – more if your children like to stop and browse at gift shops and photo opportunities. The first gift shop is right at the beginning, so you can invest in this year’s must have light up Shrek ears……. sorry we didn’t model those for you ! 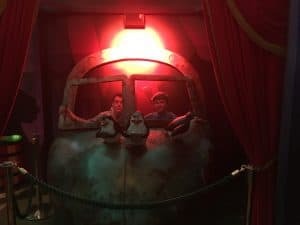 The photos below are taken in a photo gallery at the end which has highlights from Shrek, plus How to Train your Dragon and Kung Fu Panda. 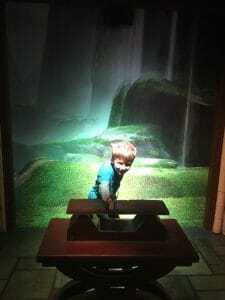 The children can climb on the exhibits while you photograph them. The staff also take your photo at several points on your journey and then present you with an album at the end for you to purchase. This is very well put together and would make a nice souvenir if you have a total Shrek nut, but it felt a bit much for us so we didn’t invest.